A comprehensive toolkit designed to be adapted and used by communities to address the impact of a levee status change. 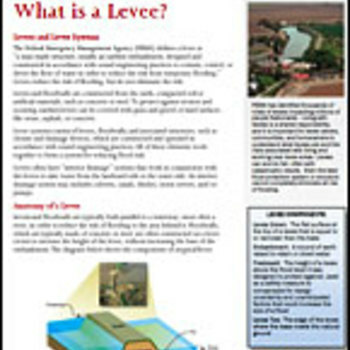 Factsheet: What is a Levee? FEMA defines a levee as a man-made structure that helps contain or control the flow of water during a flood. This fact sheet defines levee components, discusses the ownership and operation of the Nation’s levees, and what home and business owners can do to prepare for a flood. It is important to understand that levees reduce the risk of flooding, but do not eliminate the risk. For the past several years, the Federal Emergency Management Agency (FEMA) has requested data and documentation from the levee system owners or communities who are responsible for maintaining levee systems. The data are used to determine the flood protection and risk-reduction capabilities of these systems. Where the levee system met the appropriate criteria and the owners entered into an agreement with FEMA owners of levee systems that were previously accredited have been given an additional 24 months to gather and submit the required data and documentation. FEMA shows the system as a Provisionally Accredited Levee (PAL). If the required documentation is not provided, upon expiration of the PAL period, FEMA must initiate a map revision to show the levee as de-accredited. This fact sheet gives an overview of the PAL expiration process and provides information for residents in communities where a PAL agreement is expected to expire.